MK Avi Dichter calls on Supreme Court to reject petition by Arab NGO Adalah to return bodies of terrorists killed in terror tunnel. MK Avi Dichter (Likud), chairman of the Knesset Foreign Affairs and Defense Committee, said Sunday Israel's Supreme Court must reject a petition demanding a Hamas rescue team be allowed to enter to try to save terroristx. It was later announced that all the terrorists killed in the blast when the IDF destroyed a terror tunnel leading from the Gaza Strip into Israeli sovereign territory. 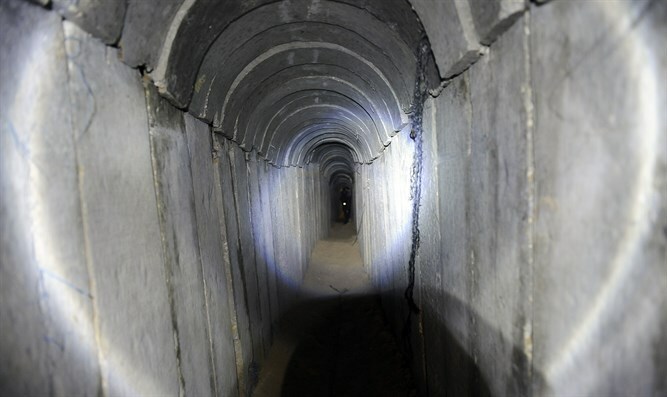 A total of 12 terrorists, most of them members of the Islamic Jihad terrorist organization, have been held by the IDF since a controlled explosion, using new and undisclosed technology, destroyed the terror tunnel. The organization then withdrew its first petiition, but sided witht the terrorist families demand for return of their bodies, claiming: "The holding of bodies contradicts the principles of international humanitarian law. Bodies of individuals who are killed during situations of conflict must be returned to their families for burial with dignity. international humanitarian law prohibits using bodies for political purposes or as bargaining chips." "The bodies of the terrorists who were taken out of the tunnel by the IDF are a bargaining chip in the negotiations over our soldiers and our citizens in the hands of Hamas," Dichter said. Dichter said there was no reason to return the bodies at this stage. "Until they bring our sons home, the bodies of the terrorists should not be released." "The Supreme Court must reject outright the demand of the hypocrites who are hiding behind the name of the Justice Organization - known in Arabic as Adalah." A spokesperson for Adalah reached out to Arutz Sheva to dispute MK Dichter's claim that Adalah had filed a separate petition to Israel's Supreme Court regarding the return of the terrorists' remains. "The statements made by Knesset Member Avi Dichter are entirely unfounded. Adalah has not filed a Supreme Court petition demanding that the state return the bodies of five deceased Palestinians to Gaza."